You’re not going to like this, but it has to be said: after 10 years, your mattress can double in size due to the sweat, dead skin and dust mites that it accumulates. So trading in your old mattress for a new one is a part of life – an event that eventually has to take place. When you buy a new mattress, of course, the store you purchase from will haul away your old one for free. You’ll never see it again. In all likelihood, it’ll end up in a landfill along with millions of other mattress. Talk about a waste of resources. Your mattress, although it may not be good enough for you anymore, can still do a lot of good for others as well as the environment. Let’s jump into a few feel-good alternatives to chucking your old mattress, shall we? 1. Donate it to a Salvation Army. Quick and easy donations to a not-for-profit organization like The Salvation Army – it’s the obvious choice, right? Yes. Yes it is. You can also claim your donation as a tax deduction, which is pretty awesome. What’s not so awesome is the fact that it has to be professional cleaned to be accepted – no stains, people! 2. Find a recycling center. If the donation route carries with it too many unrealistic specifications, another option would be to send it off to a recycling center. 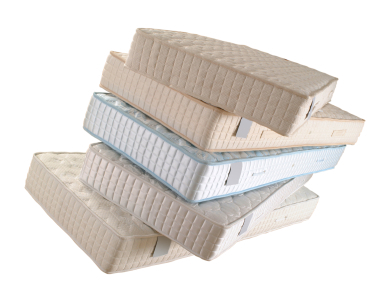 Recycling centers love mattresses because approximately 90% of a mattress is recyclable. Moreover, it doesn’t need to be cleaned or refreshed in any way – just get it there and get on with your life. 3. Homeless shelters need mattresses... like yesterday. There’s no such thing as “too many mattress” at a shelter, so do your conscience and your community a favor: donate to a homeless shelter, a woman’s shelter, or a disaster relief fund. You may have to have it professionally cleaned if it’s very dirty, but the intrinsic benefit you’ll get from knowing that people are benefiting from your kindness will be immeasurable. 4. Mattresses are soft and fluffy. Soft and fluffy – sounds like the perfect tool for playtime! If you have small children that love to play outside – by the swing set, trampoline, monkey bars, etc. – don’t hesitate to put your old mattress below any high spots they might be playing on. Just make sure there aren't any springs sticking out! 5. Animals shelters use mattress all the time. Human’s typically take precedent over animals in times of crisis; however, that’s not to say that animals don’t appreciate a little bit of comfort in naturally uncomfortable conditions. Metal cages and playpens that you typically see inside animal shelters can be very cold and uncomfortable. If you’re an animal lover, call your local animal shelter to see if they can have any use for a mattress – they might just say yes! So there you have it: 5 feel-good alternatives to chucking your old mattress. Remember – just because it doesn’t feel good to lie on anymore, doesn’t mean you can’t put it to good use. For more tips and suggestions on what to do with that old mattress of yours, call The Mattress Factory or stop-in for a quick chat – we’re looking forward to talking!